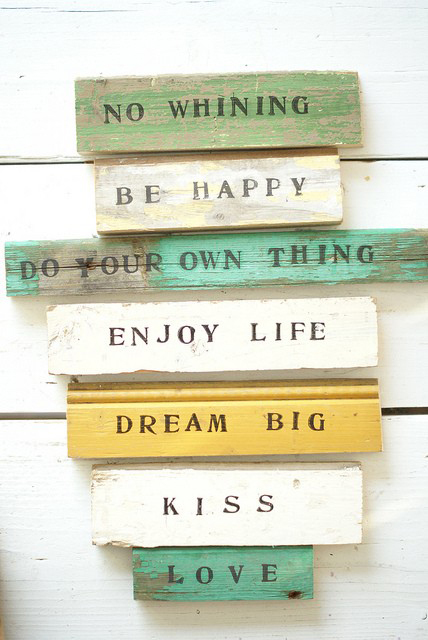 Its been another busy, long week here at Ruby so we thought a positive message was definitely what we needed this morning :) "No whining, be happy, do your own thing, enjoy life, dream big, kiss, love" - we couldn't have put it any better ourselves!! Last night we finished off a beautiful invitation suite for our forest-themed wedding (remember that from this post) - it was hard work, but lots of fun. A post will be coming soon on what they look like so watch out for that. A heads up for all our Durban readers: remember that its the 80's Rewind Festival in Durban tonight - international 80s music by the hottest lineup of pop legends, the festival is at Mr Price Kings Park Stadium. Its going to be a jam, and the weather is perfect today in Durban for it! We're moving both house in this next week so its going to be busy, but don't worry - we won't leave you without your favourite blog posts every morning, we promise! So until Monday, have a fab weekend! Love the Ruby & the Swallow team.